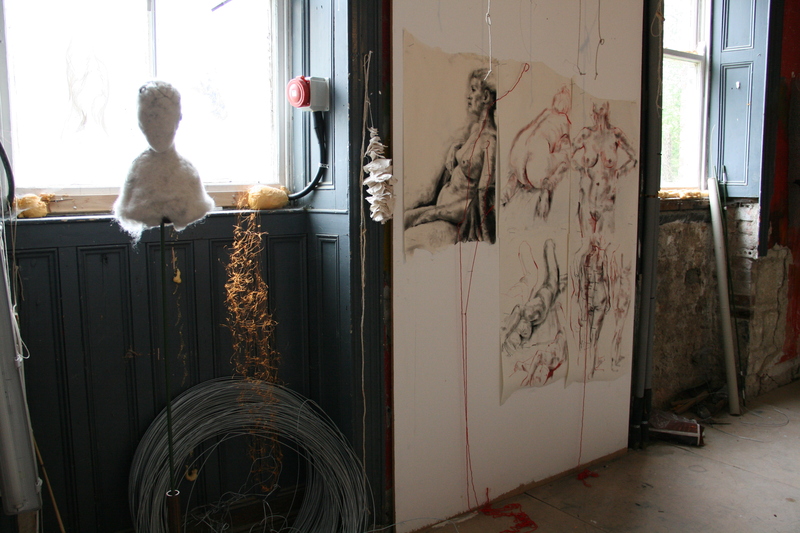 Caroline Schofield works from her studio space at Endangered Studios in Co. Kilkenny. She is a fibre artist whose work has a strong basis in figurative drawing. 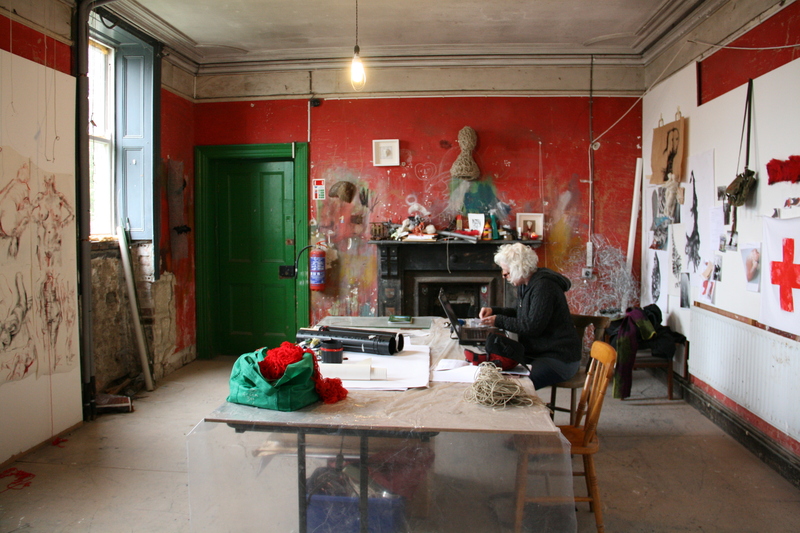 When I met Caroline she had recently finished a residency in Kilkenny Arts Office. It was a six month residency and her plan for it was to explore what the ‘human condition’ is. She said that as a child she used to look out windows and wonder if everyone she saw had been put there just for her, whether they were all just part of her imagination. This innocent self awareness is something that Caroline wanted to consider through her work during the residency. She positioned herself at the large window in the Arts Office that looked onto the street and photographed and drew passers-by. Over time there was one particular man, named Christy, that became her main focus. He started to come into the space every day and Caroline’s work began to focus on him as her primary subject. For this residency she worked through the medium of drawing because she found it more immediate than using felt, which she uses frequently in her work. Caroline drew this man in pencil most days for the remainder of the residency and she later worked the drawings into stitch. 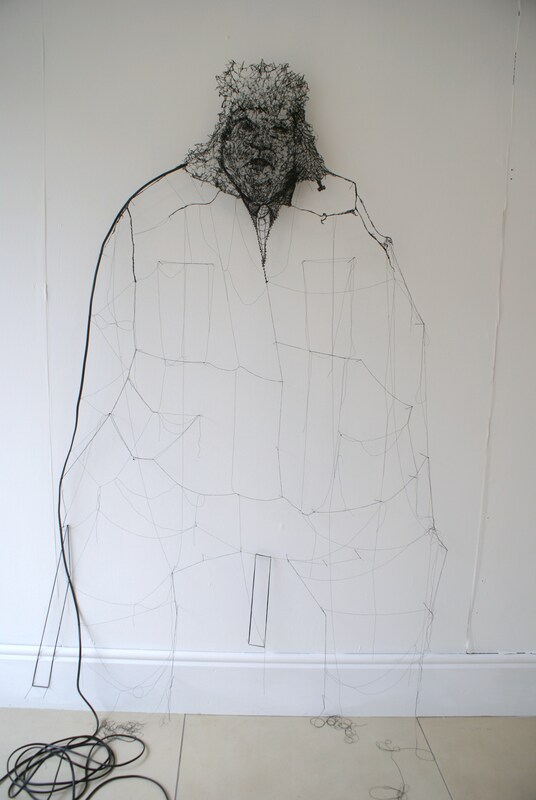 She made one big thread piece of him on the wall in the Arts Office and what she really liked about this was the fragility of it, which echoes the human condition that she was exploring through the residency. She likes the idea that this piece will have to be taken down at some stage and that it will disappear. She may make it again but the fact that it will never be the exact same is something that interests Caroline. It will be a different piece if it is made again because of the fact that her work is material driven. Making this piece took three months with three to five people working on it every day. Caroline wanted to make it using the purist method of dry felting, where fleece is built up layer upon layer using needles. The needles go through the fleece pulling it back and forth until it felts together. This process was repeated until enough material built up to form each head, they were then sculpted into shape. The hemp strings that flow beneath the heads had to be sprayed with fire retardant and then stitched onto each of the heads. The work stretches five metres in length. Caroline sculpted the top of a spine into each on the pieces because she felt the presence of the bones gave them more of a sense of fragility and humanity. 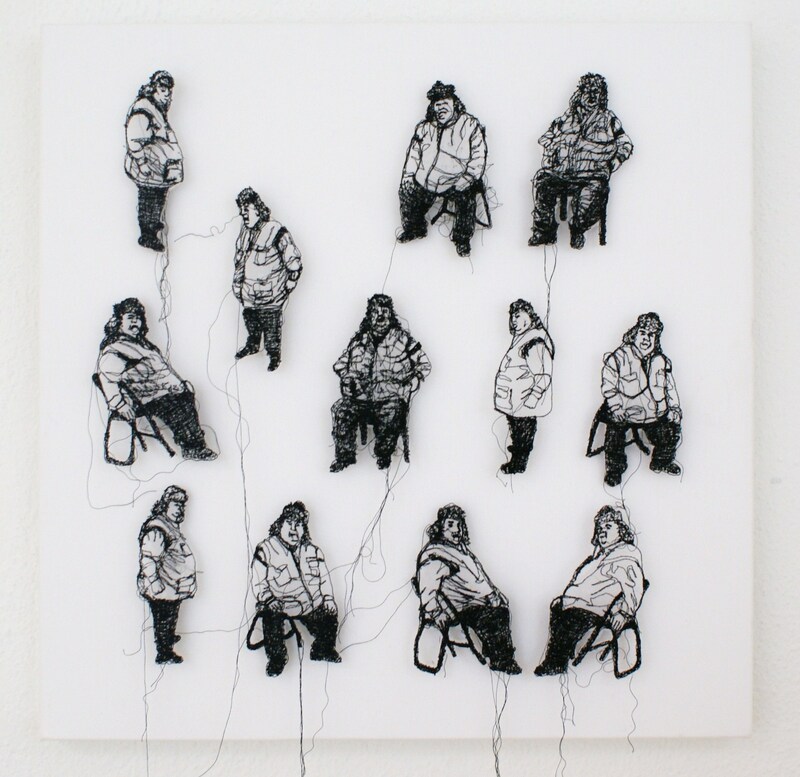 Last year, Caroline was part of an exhibition with a group of textile artists she works with called ‘Filament’. 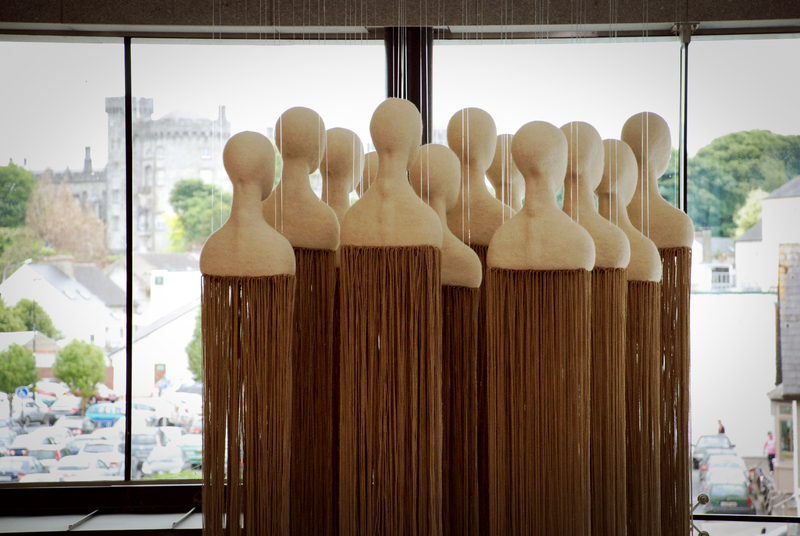 The exhibition entitled ‘Latitudes’ was shown at Airfield House and Gardens in Dublin for a month in 2011. The work Caroline chose to make identified with the lives of the people who lived in Airfield House during the First Would War. Caroline said that she believes people who fought in the First World War did so out of love and fear for their families, not for money or any other kind of reward. She described it as a ‘heart’ war. 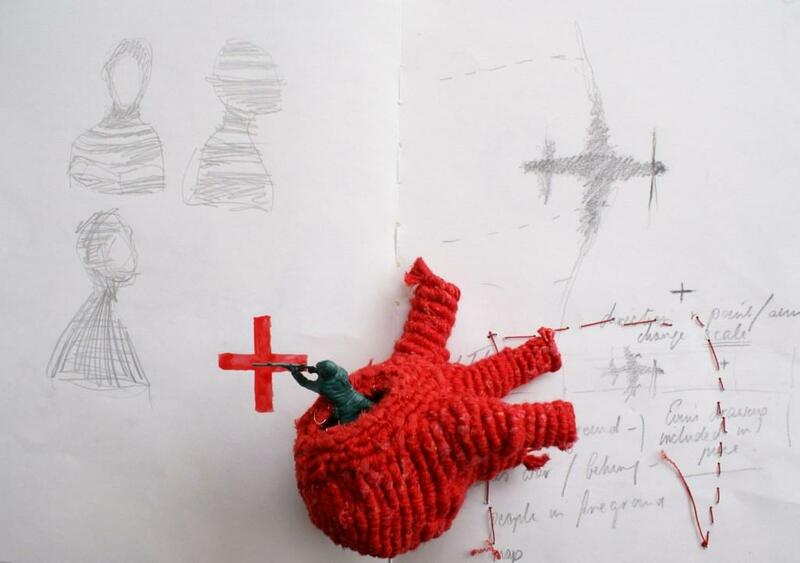 One of her pieces for the exhibition, called How to throw a Heart, looked at the fact that a human heart and a grenade are roughly the same size. Another work she made for this exhibition was called Red Cross. She staked squares of white canvas, with images of red and white crosses stitched onto them, into the grass. The Red Cross was painted onto vehicles during the war to identify transportation of medical supplies so people would not shoot at them. The group of staked canvas sheets began to look like a memorial garden when it was installed onsite, something that she had not expected to happen. She said what she loved about this exhibition was that people with a huge amount of knowledge about the First World War came to see it and taught her things about it. She also found it interesting how her work brought up emotions in people that she had not necessarily meant to evoke. Caroline said everyone brings their own feelings to her work and at a certain stage it is not about her or her work anymore, but about somebody else’s life and a personal experience they bring to the work. At the moment Caroline is at a stage where she has recently completed various projects and is considering what will come next. She said she loves this stage in her practice because she can come into the studio and clear off all the walls and just think about what’s next. She said she is never really starting afresh because all her projects move on in some way from each other, but it’s a time to pause and consider her work and it gives her the brief luxury of working without a particular end point. Caroline also wants to keep pushing the materials she uses and is constantly exploring what she can do with them. She is currently working on a long term project with an artist from The Netherlands, Elis Vermeulen, entitled 80 Percent Is Body Language. They haven’t decided what direction their collaborative work will take yet but are in conversation about where it could potentially go. Caroline said that even their conversations are interesting because although Elis speaks English, things often get lost in translation, so in this way they have already started to show the reality of the title. They plan to exhibit the work in Ireland and The Netherlands. Lovely work and i enjoyed the visit. Lovely interview with good insights into her work and perfect shots. not that wired up.. « Elis Vermeulen. Visual artist.